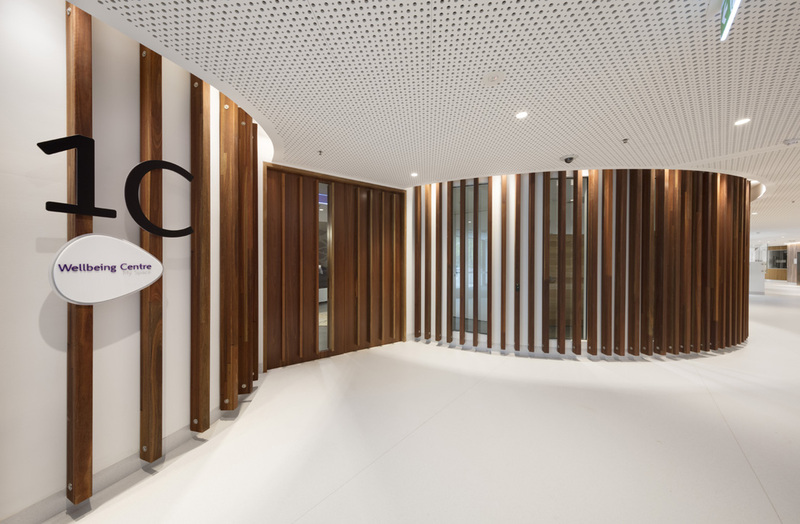 DesignInc Melbourne has designed two new centres for Melbourne’s Peter MacCallum Cancer Centre with a focus on wellbeing via thoughtful, holistic design. 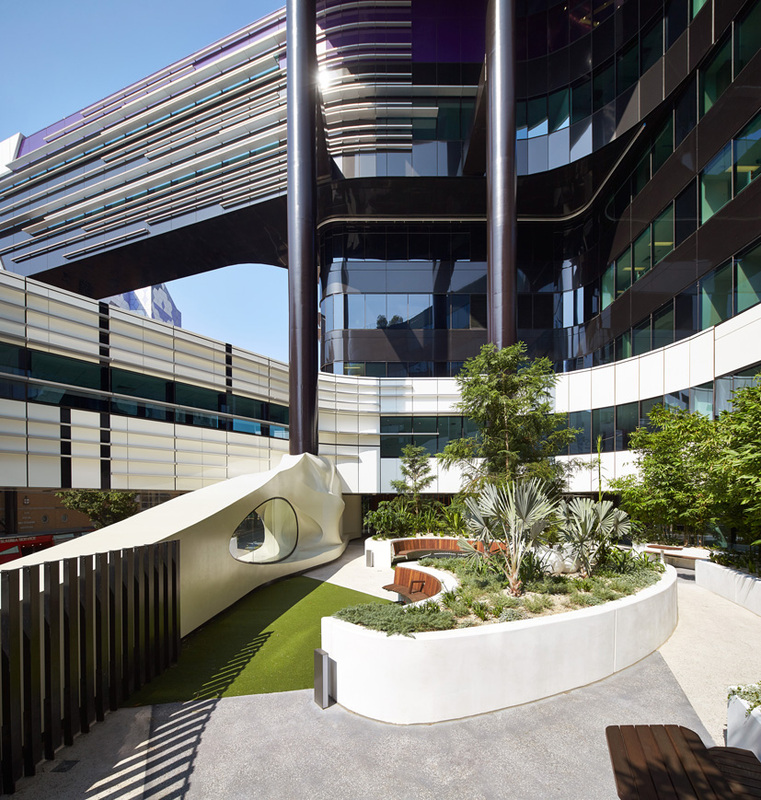 The You Can Center and Wellbeing Centre are co-located within the Victorian Comprehensive Cancer Centre, the $1 billion centre located in the Melbourne Biomedical Precinct. The You Can Centre is a dedicated treatment and support space for adolescents and young adults with cancer, and their families. It is Australia’s first purpose-built facility of its kind and the second such centre in Australia, with a third, in Sydney, currently under construction. DesignInc Melbourne was tasked with providing a lounge and clinical support spaces that create a home away from home for young patients. DesignInc associate Jane Sayers says the resulting scheme is welcoming, with the aim of normalising each patient’s experience. The You Can Centre is neither sterile or clinical thanks to a material palette more commonly associated with domestic environments. Warm timber flooring is used throughout the space and undulating timber walls allow patients and family to navigate the interior without feeling like they’re in a hospital. DesignInc has allowed the social role of the space to determine the layout, featuring a communal kitchen and lounge at its centre. There is also a series of small pods and booths where individuals can relax, study or watch TV if they don’t wish to socialise. “This flexibility comes with an understanding that we’re all different and anyone can adapt the space to their individual needs and use, giving each person a degree of ownership,” notes Sayers. The interior’s design harnesses the healing properties of nature to provide sanctuary and so does DesignInc’s other Peter MacCallum Cancer Centre project, the Wellbeing Centre. 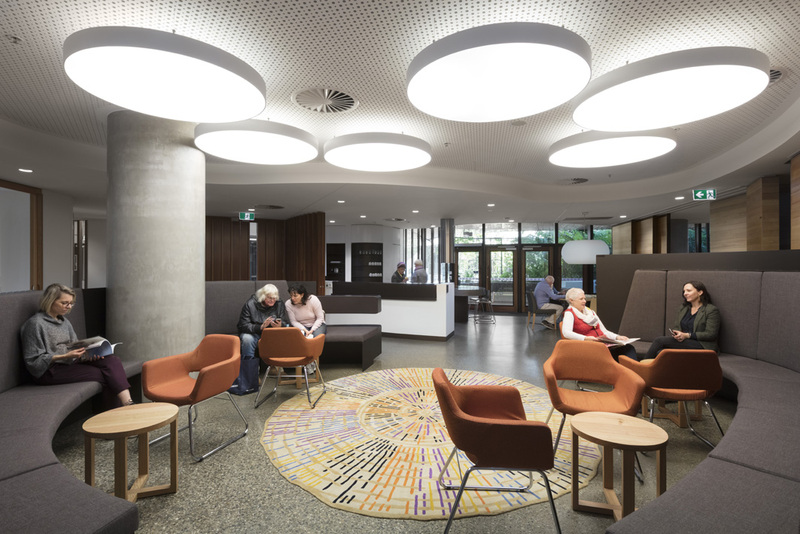 Also located on level one of the Victorian Comprehensive Cancer Centre, the Wellbeing Centre is a place where patients and their families can access wellbeing-related information and services, and also spend time in a relaxed, non-hospital environment. Hard edges and corners are minimised as curved lines and soft furnishings characterise the fit-out. 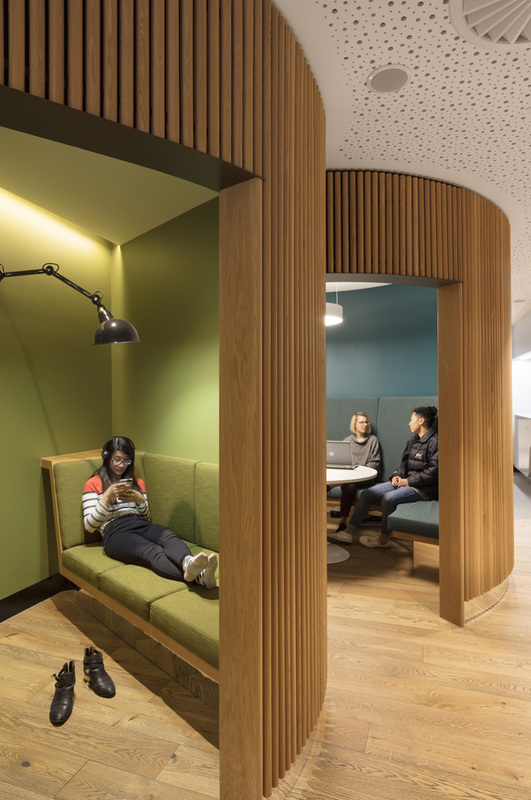 Crescent-shaped seating arrangements provide zones for individual retreat or group discussion and curved semi-partitions allow people to still feel connected while maintaining their own independence. Highlighting the interior’s natural lighting, Batey-Smith and his team have installed a central cluster of oversized circular light fittings. 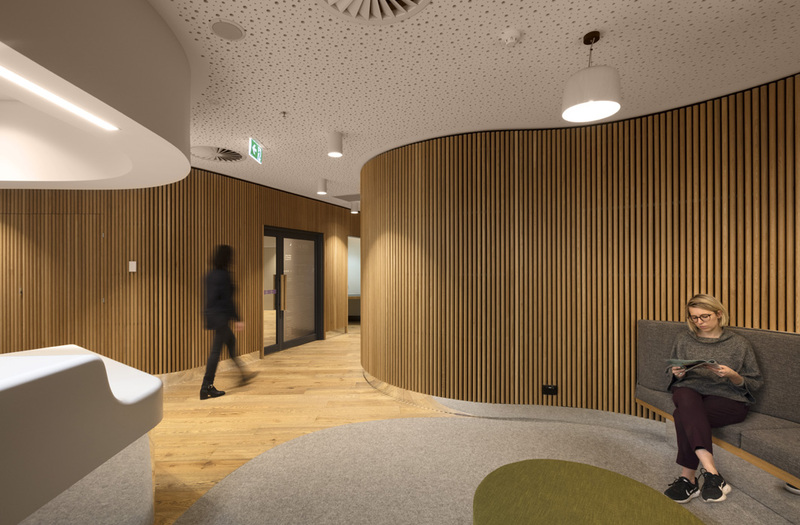 This feature, along with vertical timber battens on internal curved walls and as cladding on the Wellbeing Centre’s exterior, adds an element of craftsmanship to the overall design. Connection to nature is emphasised in this space through direct access from the kitchen table to an adjoining garden – a lush landscape in a secluded location. External seating settings visually connect to the Centre, again grouped in curved pods. Circulation paths are also generous, giving each person room to move and while staff are present in the space, the informal layout means they maintain a respectful yet approachable distance. Like the You Can Centre, the Wellbeing Centre’s scheme is also responsive to the personal experience of each individual by offering a range of different settings, from lounge, kitchen and activity spaces to an area for sleeping. Both projects aim to alleviate the fear and exhaustion often associated with cancer diagnosis and treatment.